The times are still a-changin'. The effects of the governments' activities to "repair" the impact of the events of earlier this century are still causing market participants to act like Pavlov's dogs. While we are in a somewhat artificial environment, its still the same as before - markets react to what is happening. One aspect of the current "fingerprint" is that markets are perhaps more nervous and watching for the possibility of change even more intently than before. For me, Outside In ( mean reversion to some) trades can be very effective. But as for all strategies, Outside In has a trade off. While the markets are in a trading range which is most of the time, Outside In is very profitable. However, when a trend begins, the trades have to be either filtered out or managed. 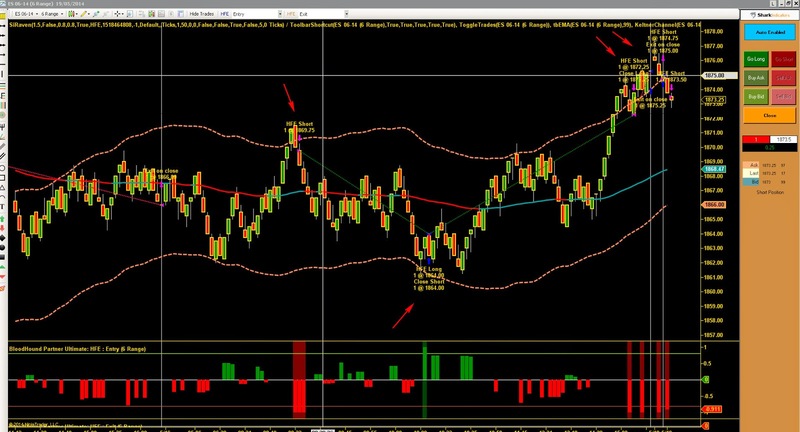 These are NinjaTrader charts with Bloodhound used to create the flobots. So how can you filter and how can you manage? Filtering is a matter of observation and testing. I can filter out trades that would be losers when the market trends using the slope of my EMAs. If the slope is too steep then no trade. Others use the Wells Wilder's ADX but I have found this to be too lagging for my timeframes. For managing, I double down. My purpose is to average the basis price of my entry. I may have to do this more than once. Yes, I occasionally take a loss because I know that the markets can stay irrational longer than I can stay solvent but again, that "uncle" point is a matter of testing. Whether I trade with a flobot or as a discretionary trader, the testing I do gives me the metrics I need to be able to maximise profitability. Without that testing, I'd be guessing. Interesting idea to use MA's (or other filters) to avoid being run over on trend days. Of course there's the trade off between too many rules and no trades, but should be worth it off to avoid being run over on a fully doubled down position on a trend day. I'm going to add that to my testing and see how it works. 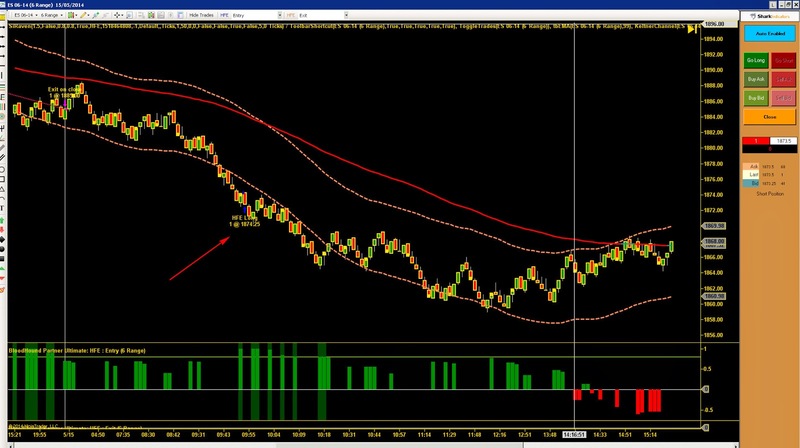 Would you elaborate on how your swing trade charts (settings and setups) are different than your daytrading ones. Do you still use range bars or do you switch to daily and 180 minute bars? Do you use the same periods for ma's, cci's etc? Do you use the same setups and triggers? Are S/R still derived primarily from MP and ma's? Any chance you will get back to posting on your options blog?? All the charts are the same. I use the input for the bigCCI to get rid of chop and identify the trend. The setting depends on the timeframe of the bar chart. It can be from 33 to 144 depending on market as well. The idea is to identify the trend and trade the pullbacks. The settings are backtested. With the impact of governments on markets, things are a bit different.